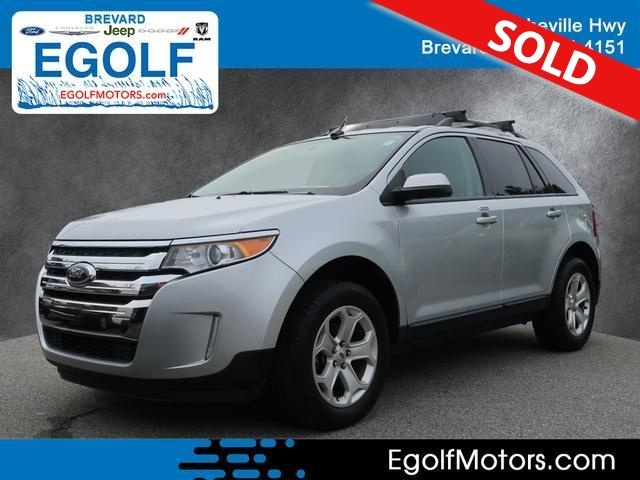 Thanks to its well-rounded nature, the 2014 Ford Edge is a respectable choice for a five-passenger midsize crossover SUV. The 2014 Ford Edge is unchanged. Quiet and comfortable cabin; abundant features; comfortable ride; composed handling; higher fuel economy from available turbocharged four-cylinder engine. When it comes right down to it, shopping for a new crossover SUV is a lot like trying on clothes. Three-row, seven-passenger models can feel way too big, while compact crossovers may seem a little too confining. That brings us to the 2014 Ford Edge, a five-passenger midsize crossover that splits the difference between these two extremes in a way that could make it a comfortable fit for you. Besides its right-size dimensions, the Edge owes its popularity to its sleek styling and a comfortable interior filled with a long list of appealing high-tech options. These run the gamut from handy conveniences like the Sync system's voice control to important safety features like rear cross-traffic alert and forward collision warning systems, both of which are designed to help avert potential crashes. The Edge also offers a likable driving experience, with confident handling and a quiet and smooth ride. The standard 3.5-liter V6 delivers a level of performance most buyers will find satisfactory, but Ford offers two other engines as well: an available turbocharged 2.0-liter four-cylinder for greater fuel economy or a slightly more powerful V6 in the Sport trim. The Edge does have a few drawbacks, most notably the available MyFord Touch system, which has a less than intuitive menu structure and can be sluggish to process commands. Accordingly, we'd encourage you to take a look at some of the Ford's similarly sized and priced competitors. Topping the list is the 2014 Jeep Grand Cherokee, which is equally comfortable in everyday driving, yet can be fitted to be more off-road-worthy. The Jeep also comes with available diesel or V8 power. Other desirable models include the well-equipped Nissan Murano, the Volkswagen Touareg and the likable Toyota Venza. Ultimately, though, the 2014 Ford Edge has found a nice middle ground between its larger and smaller competitors, and many crossover shoppers are likely to find that it meets most, if not all of their needs. The 2014 Ford Edge is a midsize crossover SUV that seats five passengers. It's offered in four trim levels: SE, SEL, Limited and Sport. The entry-level SE comes standard with a V6 engine, 17-inch alloy wheels, rear privacy glass, air-conditioning, cloth upholstery, 60/40-split-folding and reclining rear seats, a tilt-and-telescoping steering wheel, cruise control, a 4.2-inch display screen and a six-speaker sound system with a CD player and an auxiliary audio input jack. The optional Convenience package adds automatic headlights, keypad entry, rear parking sensors, a subfloor cargo organizer and an auto-dimming rearview mirror. The optional Equipment Group 101A bundles automatic headlights, keypad entry, rear parking sensors, an auto-dimming rearview mirror, satellite radio, the Sync voice command interface, Bluetooth phone and audio connectivity and a USB/iPod interface. Moving up to the SEL model gets you the above options as standard plus 18-inch alloy wheels, heated mirrors, dual-zone automatic climate control, an eight-way power driver seat (includes power lumbar), an "EasyFold" second-row seat and a leather-wrapped steering wheel. The SEL's Equipment Group 204A includes a rearview camera, leather upholstery, heated front seats and a six-way power front passenger seat (manual recline) with fold-flat capability. The 205A group has those optional features plus the MyFord Touch electronics interface with an 8-inch central touchscreen, a configurable gauge cluster, enhanced steering wheel controls, enhanced Ford Sync features and a second USB port for audio devices. The SEL appearance package adds 20-inch wheels, specific headlight and taillight treatments, a body-colored grille and unique leather/simulated suede seating. The Sport model comes with all of the SEL's standard equipment, the contents of the 204A and 205A groups, a 12-speaker Sony sound system, HD radio, a more powerful V6 engine, 22-inch alloy wheels, a sport-tuned suspension and special exterior styling. The upscale Limited also starts with a majority of the SEL's optional features as standard and then adds 18-inch chrome-finish alloy wheels, an eight-way power front passenger seat and the 12-speaker Sony sound system with HD radio. The Equipment Group 301A option adds a panoramic sunroof, xenon headlights, keyless ignition and entry, remote start, a power liftgate and a navigation system. The 302A group has those features plus rain-sensing wipers, blind-spot monitoring and rear cross-traffic alerts. Also optional are 20-inch alloy wheels and adaptive cruise control with a collision warning system. A few of the Limited's extra features, such as the sunroof, navigation system and blind-spot monitoring, are also available for the SEL and Sport. A rear-seat entertainment system with dual headrest displays is also optional for every Edge, except the SE. Under the hood, most 2014 Ford Edge models get a standard 3.5-liter V6 engine that produces 285 horsepower and 253 pound-feet of torque. A six-speed automatic transmission and front-wheel drive are standard; all-wheel drive is available as an option. EPA estimated fuel economy is 22 mpg combined (19 mpg city/27 mpg highway) with front-wheel drive and 21 mpg combined (18 mpg city/25 mpg highway) with all-wheel drive. Optional on all but the Sport model is a 2.0-liter turbocharged four-cylinder engine (called the EcoBoost) that generates 240 hp and 270 lb-ft of torque. A six-speed automatic and front-wheel drive are standard; all-wheel drive is not available with this engine. In Edmunds performance testing, an Edge with the four-cylinder went from zero to 60 mph in 8.4 seconds: slower than average, but not unreasonably so. More importantly, the EPA's fuel economy estimate for this powertrain is an impressive 24 mpg combined (21 mpg city/30 mpg highway). The Sport model is powered by a 3.7-liter V6 rated at 305 hp and 280 lb-ft of torque. A six-speed automatic transmission (with shift paddles) and front-wheel drive are standard, with all-wheel drive offered as an option. In Edmunds performance testing, an all-wheel-drive Edge Sport went from zero to 60 mph in 7.5 seconds -- a good time for the segment. Official EPA fuel economy stands at 21 mpg combined (18 mpg city/26 mpg highway) with front-wheel drive and 19 mpg combined (17 mpg city/23 mpg highway) with all-wheel drive. Standard safety features on the 2014 Ford Edge include antilock disc brakes, stability control, front-seat side airbags and full-length side curtain airbags. Also standard is Ford's programmable MyKey system, which allows parents to limit vehicle speed and stereo volume for teen drivers. A rearview camera is optional for the SEL and standard on the Sport and Limited, while everything except the SE gets rear parking sensors as standard. Optional on all trims except the SE are blind-spot monitoring and rear cross-traffic alert systems. The Limited can also be equipped with a forward collision warning system. In Edmunds brake testing, an all-wheel-drive Ford Edge Sport stopped from 60 mph in 122 feet: better than average for this class of vehicle. In fairness, that particular Edge was equipped with giant 22-inch wheels and sticky summer performance tires, but a four-cylinder Edge with more conventionally sized 18-inch wheels and all-season tires managed to stop in 124 feet, still a bit better than average for this class. In the most recent government crash tests, the Edge received an overall rating of four out of five stars. Within that score, it received three stars for overall frontal protection and five stars for overall side protection. In Insurance Institute for Highway Safety crash tests, the Edge scored the highest possible rating of "Good" in the moderate-overlap frontal-offset, side-impact and roof strength tests. Its seat/head restraint design also earned a top "Good" rating for whiplash protection in rear impacts. Inside the 2014 Ford Edge, you'll find an attractive cabin with a modern look and feel. The available MyFord Touch system adds to the sleek high-tech appearance with a large centrally located touchscreen and two smaller screens in the gauge cluster. These configurable displays can show a wide range of audio, climate and navigation system information. While the MyFord Touch interface looks slick, its operation is hampered by small virtual buttons on the main touchscreen and controls that are slow to respond and prone to the occasional glitch. You'll likely acclimate to MyFord Touch and its idiosyncrasies (plus, the Sync voice command system continues to be a useful workaround), but in general, other systems are easier to use. Up front, the Edge offers seats that are impressively comfortable and supportive. Rear-seat passengers will be comfortable in the outboard positions, thanks to reclining seatback cushions that offer good comfort and decent legroom, but the rear center position is fairly uncomfortable (unless you're a toddler riding in a car seat). Tall passengers will also find rear headroom in short supply in Ford Edges equipped with the panoramic sunroof. When it comes to cargo capacity, the Edge offers a useful 32 cubic feet of space behind the second-row seats. Fold the 60/40-split seatbacks down and you end up with a slightly sloped load floor and 69 cubic feet of space. Shorter individuals may have trouble reaching and closing the rear liftgate on Edges that don't have the power liftgate option. On the road, the first thing you notice about the 2014 Ford Edge is its civilized ride quality and hushed interior. Also notable are the Edge's secure handling and precise steering -- both of which make it easy to maneuver. The Sport model's handling is even more responsive, but its firmer suspension and oversized wheels make the ride too harsh. The standard 285-hp V6 engine's balance of performance and fuel economy should suit most buyers. The Sport model's gutsier V6 may seem attractive if you're plagued by a heavy right foot, but it doesn't provide significantly quicker acceleration. Meanwhile, the available turbocharged four-cylinder might not seem like enough engine for a vehicle this size, but its impressive refinement and better fuel economy should be enough to convince you otherwise. The six-speed automatic transmission matched with all three engines is capable, but it's tuned to maximize gas mileage and that means it can be slow to downshift in highway passing situations.